Hello Friends, looking for How to Wake up Early in the Morning ? So here we are giving you some amazing tips of daily life which will surely help you too wake up early in the morning so that you can start your day early and in fresh mood. Many people daily decide to wake up early in the morning so that they can do workout, do their studies, pending work, etc but could not because of sleeping late, no proper sleeping time. 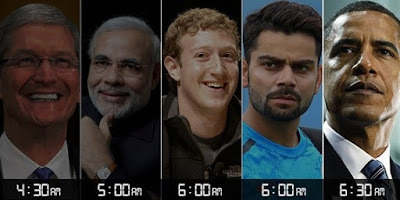 So people who find getting up early in morning difficult can checkout the article where you can find some working ways how you can wake up early in the morning. Feel free to ask questions in below comments. Success never comes easy. The road to the top is bumpy and challenging. And the first step towards it, it seems, is getting up early. Yeah its true people who start their day early are more successful people because they are able to take life decisions more easily then others and are more focused towards their works. There are many famous personalities who get up early and start their day early in the morning. If you take example of Apple's CEO Tim Cook is known for getting up and sending out company emails at 4:30 in the morning, according to Gawker's Ryan Tate. By 5 AM he can be found in the gym. And he works late too, priding himself on being the first in the office and the last out. It's no coincidence that so many successful people get up early. The early bird schedule is good for responding to people and events around the world, getting a head start on people in your own time zone, and also finding time for workout and family. What's more, research shows that early risers tend to be happier and more proactive. Starting day early keeps you active for the whole day. You can Plan your day accordingly. Can do workout, exercise which will help to keep you fit. Morning people can anticipate problems and minimize them efficiently. People are more optimistic they try to find positive in every things coming to them. You get a quiet zone to focus on your personal work. You get more time to spend with your family, friends etc. Firstly, you need to make sure make your mindset "you have to" attitude. Make sure you are sleeping early, so that you could wake up early. Now, while setting alarm you should keep your alarm clock or mobile a little away from you and at a height because in the morning if you wake up and try to reach to it you're 70% awake. Also at night while going to sleep you need to drink a glass of water so that when the alarm rings you wake up to switch it off, and also use the washroom which will make you 100% awake. After this I don't think you would able to sleep if you have something important do in life! Doing this for a week you will wake up without alarm clock as your mind would have get use to it. This things was just to get you up from your bed so that you break with your sleep. We had tried this things and which surely worked in a positive way. Few days later we didn't needed a alarm clock as we could wake up without it. And surely I have experienced a amazing day by waking up early completing my pending work, going for jog, doing yoga, spending time with my family, planning my daily schedule for the day etc. Surely it will help you too if you start working on this. just remember leave all your work and plan your sleep accordingly to have 6 - 7 hours of sleep everyday. So this was all about How to Wake up Early in the Morning. Hope you liked our article. Getting up early in not a big deal if you have made a mindset that you need to wake up early in the morning you will surely do!. Just make sure you sleep early so that you could atleast have 6 -7 hours sleep so that your mind is all set for the next day. people often get into chatting and surfing internet and sleep late which makes impossible for you to get up early in the morning. Just try the above mentioned steps which will surely help you to achieve for what you are looking. Few days you would feel hectic but you will get addicted to it and you could easily wake up without alarm clock. Feel free to ask questions regarding How to Wake up Early in the Morning in the below comments.